From Octopus Wrestling under the Tacoma Narrows Bridge to the Milton Mule that ran for office – and won! 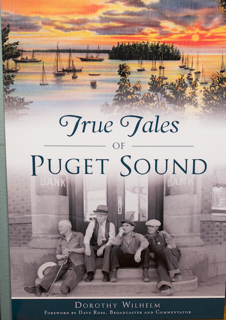 – the communities surrounding Puget Sound have exceptional stories as part of their heritage. Humorist, newspaper columnist and True Tales of Puget Sound author Dorothy Wilhelm promises to tell “stories you’ve never heard before” this Saturday, April 6 at Neely Mansion in Auburn. Each story in her new book, now in its third printing, was told to her as she produced her TV show in these communities, and the carefully researched facts provide surprising conclusions. Join Dorothy for story telling and book signing at the landmark Neely Mansion, listed on the National Register of Historic Places. Special guest Elsie Taniguchi, whose story is featured in the book, will discuss spending part of her childhood in a World War II Japanese-American internment camp.